Imojjen lines up a shot against Othniel. This year, I though it might be a good idea to introduce the students of Toongabbie Christian School in Western Sydney, where I work as a Visual Arts teacher, to the game of Subbuteo. In the first term, students were invited to come along at lunch time once a week and learn how to play, have some games against each other and practise some of the finer details. In the second and third terms, students were then given the chance to compete in a competition while, with a few pitches in the room, there was also the chance to continue to play just for fun. 20 students signed up for the competition, ranging from Year 7 through to Year 11. They were split into 5 groups and played each other in their groups. Of these, the top player from each group went directly to the quarter-finals, as did the best second placed player. The other 4 second placed players went to a barrage round to decide the other 2 quarter finalists. 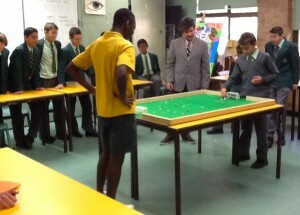 Harrison lines up a goal-flick during the grand-final against Othniel. Following the group games and finals series, the two players to qualify for the grand-final were Othniel from Year 9 and Harrison from Year 7. Harrison had got there undefeated, though had survived a penalty shoot-out in the quarter-finals against his good friend, David, while Othniel had lost his opening group game but had improved with every game since then. In the grand-final itself, the two players were very evenly matched. Both created chances in open play but could not get their shots into the back of the net. With 5 minutes to go in the match, however, Harrison had a shot which smashed into the hand of Othniel who was attempting to flick one of his defensive figures. The result of this was a penalty to Harrison for hand-ball. Othniel was unable to keep the ensuing shot out and Harrison took the lead. 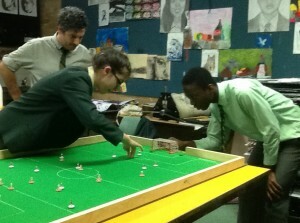 The final few minutes saw Othniel push his figures forward in attempt to find an equaliser, but Harrison held firm to become the school’s first Subbuteo Champion. The tournament whet the appetite of those who competed as well as others who came to watch and play socially. We are now looking forward to 2016 when we can start all over again. This entry was posted in News on 18/09/2015 by ajebec.